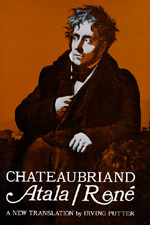 Chateaubriand was the giant of French literature in the early nineteenth century. Drawing on eighteenth-century English romanticists, on explorers in America, and on Goethe's Werther, he had a profound effect on French writers from Victor Hugo and Lamartine to George Sand and Flaubert. A quixotic and paradoxical personality, he combined impressive careers as a brilliant prose-poet, a spiritual guide, a high-ranking diplomat, and an enterprising lover. Atala and René are his two best-known works, reflecting not only his own joys, aspirations, and despair, but the emerging tastes of a new literary era. Atala is the passionate and tragic love story of a young Indian couple wandering in the wilderness, enthralled by the beauties of nature, drawn to a revivified Christianity by its esthetic charm and consoling beneficence, and finally succumbing to the cruelty of fate. Perhaps even more than Werther or Childe Harold, René embodies the romantic hero, and is not wholly foreign to the disorientation of youth today. Solitary, mysterious, ardent, and poetic, he is in open revolt against a society whose values he rejects. Withough question this archetype played a large part in determining the course of French literature up to the 1850's.